Tickets have gone on sale for the first show in a new season of plays by Market Harborough Drama Society. It tells the story of Caroline Crale who was convicted of the murder of her husband and died in prison. Years later, a letter written on her deathbed casts doubt on her guilt and her daughter sets out to clear her name. The only question is: if her mother was not the guilty party, then who was. In other words – ‘whodunnit? A new season of shows was announced by the group and features a world amateur premiere as well as established works by the likes of Oscar Wilde and Alan Ayckbourn. Following on from the crime thriller Pink Mist can be seen in November. It tells the story of three young men who are bored with their humdrum existence. They join the Army and end up in Afghanistan. 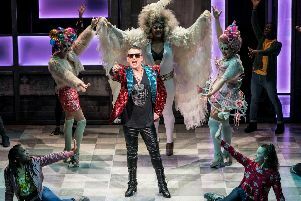 The group believe it will be a world premiere amateur performance and had to get special permission ahead of its general release. In the new year, Season Greetings by Alan Ayckbourn will be staged. The play sees plenty of mistakes and mayhem when a new boyfriend doesn’t understand unwritten family rules during an annual family gathering. Following that will be another double bill of one act plays, the first is entitled Two Sisters, a Checkov-style play about sisters who arrive home to find coffins in their room. The second is entitled The Cagebirds and is about domesticated bliss interrupted. People can travel back to the 1980s with the next show in April. Bouncers is set in a Northern night spot and sees four doormen playing multiple parts to depict the various events going on inside the club. The penultimate play in the season is Whose Life Is It Anyway which sees Kene severely injured in a road accident and paralysed. Yet he is still mentally alert and he fights for the right to die with dignity against the wishes of his medical team. Market Harborough Drama Society’s final show of the season is an Oscar Wilde classic The Importance of Being Earnest. The comedy of manners has delighted audiences for more than 100 years and has also been a hit more recently when the play was revived to critical acclaim in the West End. People are advised to book tickets for the show as they are selling out fast. For more details or to book tickets visit www.harboroughtheatre.com.